Visitors from all over the world head to Córdoba to admire monuments that the city’s blessed locals walk past on a daily basis. Here are a seven truly epic attractions of which every Córdobese can be justifiably proud of having on their doorstep. Córdobeses are unique in Andalusia for having the remains of an entire medieval city on their doorstep. The Moorish city of Medina Azahara – ‘The Shining City’ – was once the adminstrative capital of Al-Andalus, as Moorish-ruled Spain was then known. Situated some 8km (5 miles) outside the city of Córdoba in stunning countryside, it was started in 936 on the order of the Umayyad Caliph of Córdoba, Abd-ar-Rahman III al-Nasir. Not only did Rahman III want to build a complex of governmental palaces and residential quarters, but the Azahara was also intended to assert his might over other great Moorish dynasties in northern Africa and Baghdad. Construction proceeded apace and by 941, when the Caliph took up residence in the Azahara, the mosque and main palace were already completed. Additions and alterations continued for decades, but in 1010 Azahara was looted and thereafter stood deserted for centuries. 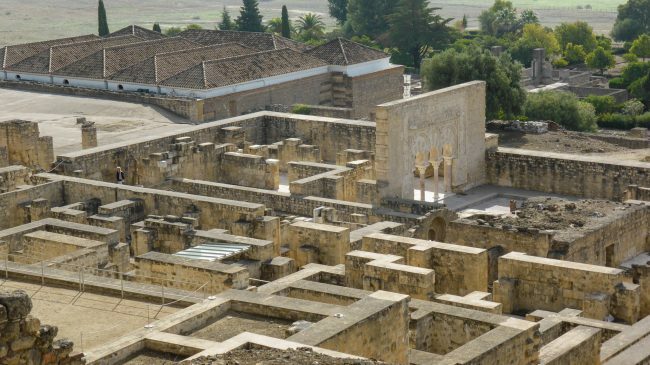 Its remains were not discovered until the beginning of the 20th century and, although they only account for about 10% of the original city, they nevertheless give you a good idea of just how magnificent Medina Azahara must have been. Those who live in the oldest quarters of Córdoba are lucky enough to walk past one of Andalusia’s most iconic buildings on a daily basis. The city’s Mosque-Cathedral is the greatest dual-identity monument in Spain and a powerful symbol of the two cultures that have shaped Andalusia. After the Moors captured Cordoba in 711, what had previously been a Visigoth Christian church was split in two and used by both Christians and Muslims as a place of worship. But in 784, on the orders of the Emir Abd al-Rahman, the church was destroyed and work began on a great mosque. Construction lasted for over two centuries and the building was eventually completed in 987, by which point Córdoba was the most important city in the Islamic Kingdom. When the city was reclaimed by Christians in 1236, the mosque was converted into a church, and in the 16th century Charles V added a Renaissance nave on top of the Moorish structure. The mosque’s most famous feature is its vast main hall, supported by over 850 double-arched columns. Sunlight and shadows create unusual effects as you wander among them, contemplating the complex history of this great building. The parts of Córdoba of which its inhabitants are most proud – and justifiably so – are the beautiful patios and courtyards of houses in the oldest parts of the city. Every May, the these spaces are opened to the public for the city’s Feria de los Patios, in which locals compete for the honour of having the prettiest space (a prize is awarded at the end of the month). Designed, grown and arranged throughout the year, the patios are romantic oases of cool and colour, where the placement of every bright red pot of geraniums has been carefully thought out. Proud owners are often on hand and delighted to talk to visitors about the varieties of flowers and plants adorning their courtyards’ walls, while in some of the larger spaces there are live flamenco guitar performances. UNESCO recognised the unique charm of the patios feria when it declared the event protected cultural patrimony in 2012. Those locals who live in Córdoba’s old town must be some of the luckiest in Spain. 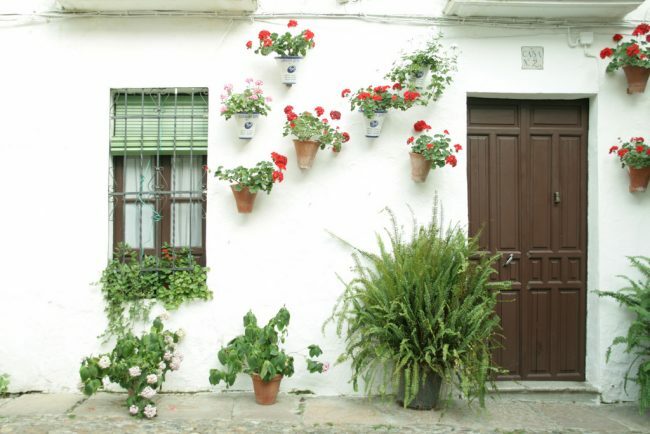 Even when compared to the oldest neighbourhoods of other major Andalusian cities, Córdoba’s is conspicuously charming, with its side-by-side white houses decorated with pots of aromatic jasmine and geraniums. Particularly attractive in this respect is the Calleja de las Flores, a narrow, winding lane lined with some of the prettiest and most colourful houses you’ll come across in Andalusia. Whilst wandering, keep your eyes open for this barrio’s hidden treasures – namely, the private patios and courtyards that are opened to the public every May for the city’s enchanting Feria de los Patios (see above). 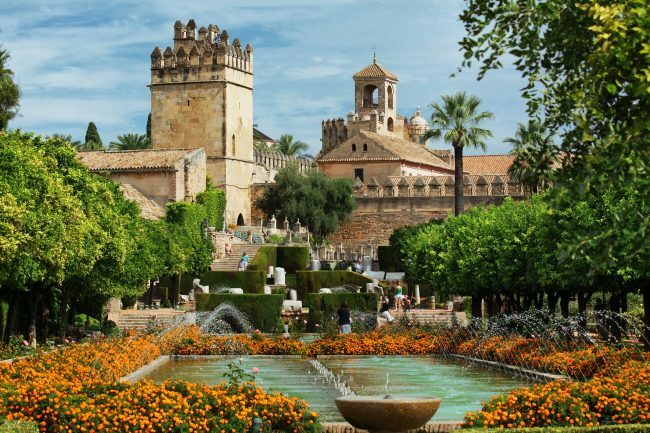 The ‘Castle of the Catholic Kings‘ is the kind of place that Córdoba’s locals probably take for granted, yet it is one of the city’s key architectural landmarks. As its name suggests, the construction of this royal palace was ordered by the Catholic King Alfonso XI of Castile in 1328 but – as is so often the case in Andalusia – it was built amongst the ruins of a vast Moorish fort. 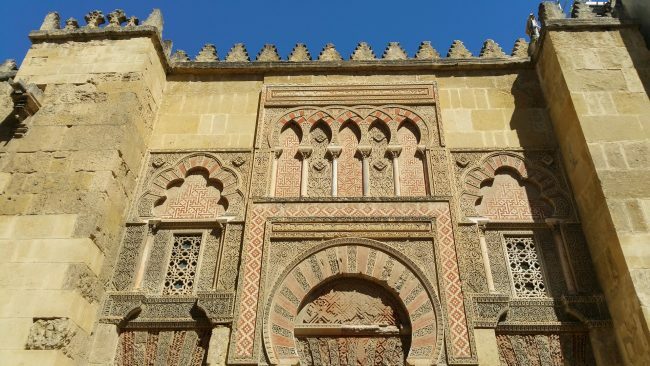 In the late 10th century, when the Islamic Kingdom was at the height of its powers, Córdoba was the kingdom’s – and indeed one of the world’s – great intellectual cities, and the Alcazar housed the largest library in the west. Alfonso used only a fraction of the remains of the original Moorish structure in building the Alcazar, but he chose a Mudejar style, so the Moorish feel of the site has been preserved. Córdoba’s locals live amid monuments from all three major periods of their city’s history: Roman, Moorish and Christian. 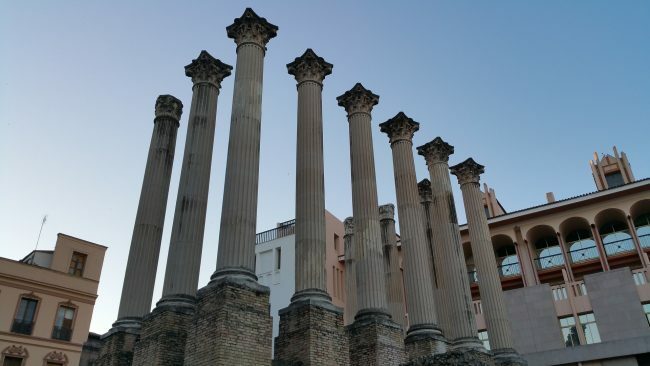 It was not until the 1950s, when Córdoba’s town hall was being expanded, that the remains of what was probably the city’s most important Roman temple were discovered. Built during the reign of Emperor Claudius in the middle of the 1st century AD and renovated in the 2nd century AD, the temple boasted a plethora of giant columns, 10 of which remain today, reaching up into the sky amid modern apartment blocks and offices (indeed, the town hall is just in front of them). Archaeologists have theorised from the quality of marble and workmanship used in the construction of the temple that it must have been a particularly impressive structure, perhaps even one of the most beautiful in the Roman Empire. 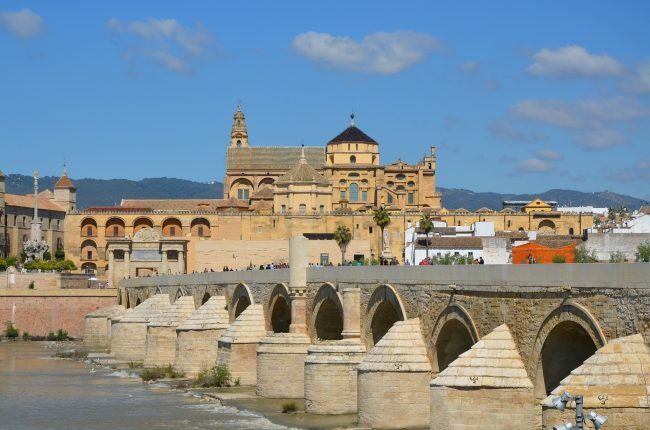 Córdoba’s famous Roman Bridge, or Puente Romano, dates from the 1st century BC and was extensively rebuilt in the 10th century during the Moorish occupation of the city. Sitting low over the opaque waters of the Guadalquivir, which flows down all the way through Andalusia and out into the Atlantic, it is supported by 17 stone arches, of which just two once belonged to the original structure. The middle of the bridge, next to a 17th-century statue of Saint Raphael, is the perfect spot from which to survey Córdoba and the green, hilly countryside that surrounds it: it’s a perspective that even locals stop to enjoy while walking over the Puente Romano.